Four months ago, we called the August Smart Lock superb. I knew that sooner or later, I'd invite one into my home. 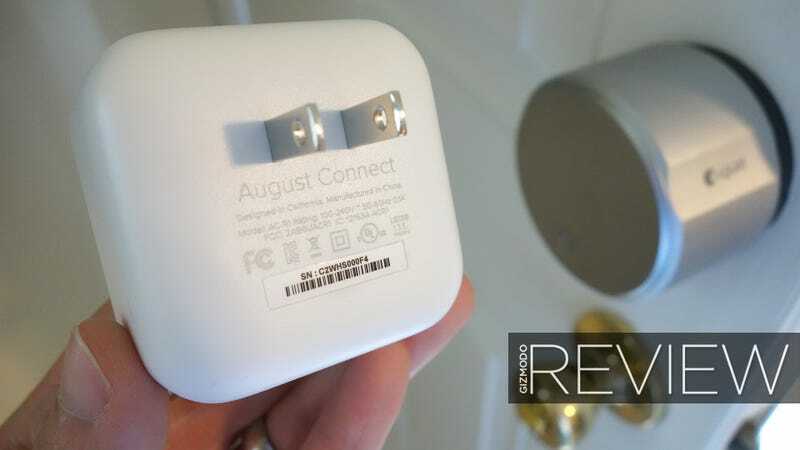 I got my chance a few weeks ago with the August Connect dongle, a $50 add-on that gives the lock internet access so you can control it from anywhere in the world. Sadly, it also revealed the lock's nastiest flaws. In case you're not familiar, the August Smart Lock is a $250 cylinder you install on the inside of your door. You don't actually need to remove your lock, because it only replaces your deadbolt thumbturn. It's super easy, even fun to install, and takes practically no time at all. Then you've got a Bluetooth-connected, motorized deadbolt that can remotely lock and unlock the door when you press a button on your phone. Or automatically lock as you leave, and unlock as you approach. Or even let other people unlock your door for a limited period of time if you send them a temporary invite—friends, guests, and so on. The $50 August Connect takes it to the next level, or so the company suggests. It's a little box that plugs right into a power outlet and connects the lock to your home WiFi. Normally, you can only access the lock if your phone is within Bluetooth range, but the Connect lets you do it from anywhere. Worried you forgot to lock the door? No worries, you can check from the car! Want to let a friend into your house while you're away? Open the door from afar. That sounded perfect to me, because my wife and I are always stressed about whether we remembered to lock the door, regardless of whether we're headed out for errands or merely headed off to bed for the evening. (Our bed is out of Bluetooth range as well.) We're not paranoid without cause: I've actually forgotten to lock the door a couple times, and our little Shih Tzu almost got out. And there are times my colleague Sean Buckley, who lives across town, has needed to drop things off at my house. I figured I'd install this $50 hub, turn on the auto-lock and unlock features, and finally be totally secure. But it didn't take long for my foolish dream to come crashing down. First off—and I should have seen this coming a mile away—you need to understand that the August Smart Lock only controls your deadbolt. Not any other lock you've got on your door. So if you live in a household which is paranoid enough to also lock your doorknob, you're done. I literally facepalmed when my wife pointed out the simple limitation. Sadly, it means that the sort of people who most need the Connect can't use the lock at all. Second, I discovered that despite August's earlier promises, the Android version of the app doesn't yet support the auto-unlock feature. I wouldn't be able to just walk up to the door and turn the knob. I wasn't going to let those two things derail my review, though. We agreed to try using the deadbolt by itself for a bit, at least when we took the puppy out. So I installed the Connect (it's easy! ), set the August to always auto-lock 30 seconds after I open the door, and stepped out into the cold. Out on a walk with our little dog, I checked my phone. At first, it couldn't find the lock. The app prompted me to reset my Bluetooth connection—which seemed pretty silly since I clearly wasn't anywhere near my house. I realized I needed to hit the little Remote Connect button in the corner of the app—and sure enough, it slooowly pinged my lock at home. It took way longer than I'd expected, long enough to make me wonder if it was actually working. But there it was: a big red dot signifying that my door was secure. I got home, reached for the doorknob, and walked right into my house. The lock wasn't locked. I checked my app to be sure. It claimed the door was perfectly secure. I fiddled with it. I locked and unlocked the bolt with the app several times, and soon found the problem: unless I firmly held the door closed, the deadbolt wouldn't smoothly slide into its socket. The August would smack-smack-smack that deadbolt into my doorframe, fruitlessly, and then give up. The scary part: it would always report back that the door was successfully locked, even when it most definitely wasn't. Needless to say, that's unforgivable, and completely defeats the point of having a sanity check from anywhere in the world. The Connect's other primary feature, unlocking the door from a distance, did indeed work as promised. I unlocked the door for a friend over a cellular network. It's slow and awkward, but not as slow as driving home! And it sure beats the hell out of the normal way you give guests a temporary pass, which requires them to download an app, register an account, take a picture of themselves, then verify their email address AND phone number all before they can open the door even once. I'll give it to you straight: the August Smart Lock didn't work for my family at all. It didn't make any sense to use a smartphone and a big bulky silver dial, when neither it nor its $50 add-on gave us any additional peace of mind. (The still-crippled Android app didn't help.) If you're willing to live with a Bluetooth-connected deadbolt as your only lock and ignore the beta features, it might work for you. It sure is easy to install! But I'm not so sure I'd recommend it to anyone now. After only a couple weeks of use (and admittedly some more smack-smack-smacking) I'm worried my lock may be starting to break. It doesn't always open all the way anymore, and it's starting to make nasty grinding sounds. Yesterday, I reached for the dial and found it wouldn't turn manually. I couldn't open my own goddamn front door without reaching for my phone. That was the last straw. I grabbed a screwdriver, removed the August, and put my simple deadbolt thumbturn back where it belongs.